In a dry-locked metroplex like Phoenix, Arizona, the sanitary processing of municipal water is a perpetual struggle of man versus nature that directly impacts the region’s ability to grow and thrive. Accordingly, with aging machinery assets at four water-treatment facilities and dozens of potable water wells, recharge wells and pumping stations, the Phoenix suburb of Chandler proactively hired a lubrication and oil analysis expert certified by the International Council for Machinery Lubrication (ICML) to develop predictive maintenance programs that would extend the reliability and service life of these assets. 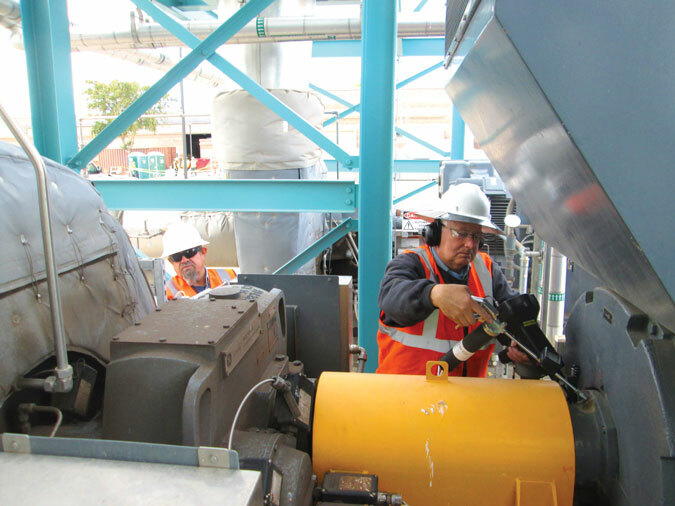 When Richard Hunt joined the City of Chandler, he recognized that overall predictive maintenance (PdM) was an area of great interest to the reliability management team, even beyond lubrication enhancement. “It all started as a training thing,” recalled Hunt, who currently serves as Chandler’s senior utilities PdM technician. Various monitoring technologies had long ago become accessible to a broader spectrum of factory personnel, so training had become more commonplace. The utilities group soon decided the best option for a comprehensive solution was to hire a PdM-oriented person from the private sector who could hit the ground running. 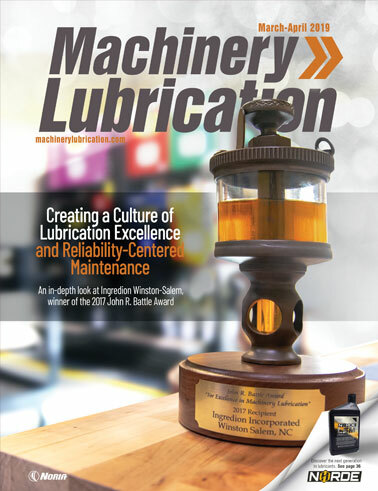 As a certified Machinery Lubrication Technician (MLT) and Machine Lubricant Analyst (MLA), Hunt was already familiar with the current science and best practices for lubrication and oil analysis. His responsibilities would now include the health of machinery assets such as pumps, fans, blowers, mixers, gear reducers and belt presses. Hunt initially directed his attention to the Pecos Surface Water Treatment Plant (PSWTP) where he was based. For instance, Hunt found there was no consistency in the selection of lubricant types or brands across all machinery. Fluid sampling was nonexistent, so oil changes were based on the calendar rather than the condition, leading to inefficient usage and labor costs. Furthermore, most of the oil inventory was stored outdoors - a less than ideal situation, given the Arizona heat and dust storms. Covered cages offered little more than shade. “Everything was outside or tucked into various corners of the maintenance shop,” Hunt added. Even the sealed oil drums were no match for regional dust storms. Hunt applied his expertise to conduct an audit of conditions at all four plants and mapped out some recommendations. He even touched base with the local representative from a reliability equipment vendor to conduct a courtesy assessment, and that vendor’s findings corroborated his own. This was when he noticed his ICML certification bolstered his position. Since then, Hunt has established a clean and organized lubrication storage room at PSWTP, bringing all drums and containers indoors. This room includes color-coded asset lubricant requirements, containers and, perhaps most importantly, climate control. He also has identified and documented bearing grease frequencies and volumes, and has been replacing the original desiccant breathers with 2-micron filters to combat the dust more aggressively. Having switched from a calendar- to condition-based schedule, Hunt now samples asset fluids for testing by a third-party lab. He believes the benefits of this new practice outweigh the cost. Just because Hunt initiated these improvements at PSWTP did not mean his budding lubrication program would persist. He understood that sustained success would constantly face shifting priorities of municipal funding as well as the status-quo mindset among longtime colleagues and suppliers. These culture issues can make it challenging to move forward, even with a lubrication champion like Hunt. One might expect a program that prolongs machinery life without sacrificing operational efficacy would be an easy sell when seeking funding and adherence, but Hunt frequently finds himself trying to bring his fellow workers and managers up to speed. "There are a lot of factors involved in trying to get them to understand why we need to test the oil, why we need to put the breathers on, why we should have sample ports or why we should even sample the oil,” he said. 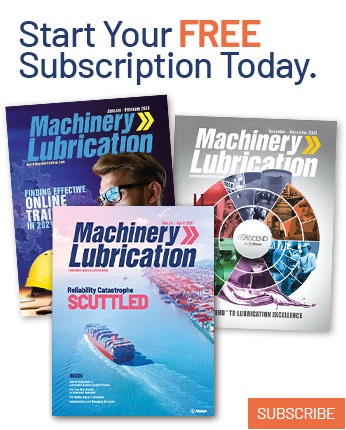 While certification is not required for everyone in the division, education has helped the decision-makers to work together toward lubrication excellence and made it easier for Hunt’s recommendations to be funded and implemented. It’s not just managers who can benefit from training but also the hands-on personnel interacting directly with lubricants. As new PdM practices are adopted, Hunt has discovered that it becomes easier to get management and other staff to follow the decisions being made regarding oil changes. “Our position with them is, ‘We’ve gone to the training, and we’re certified in doing it. This is what will get you the longest asset life,’” he said. Fortunately, the City of Chandler does support training. In 2017, lubrication technicians from all four of Chandler’s water facilities attended Noria Corporation’s independent training course covering content from ICML’s MLT I body of knowledge and then sat for the certification exam. In addition, one of Chandler’s certified senior mechanics based at the Ocotillo Brine Reduction Facility has accepted a role as a PdM technician to work with Hunt across all the treatment plants. With these newly certified personnel now involved with the program, Hunt anticipates smoother acceptance as he coordinates expansion of his PSWTP enhancements to Chandler’s other water plants. “The cost of certification is best seen as an investment, because ICML is a recognized authority in lubrication,” he explained. Hunt also recognizes that the economic impact could be substantial as his certified team expands these practices throughout all the plants, water wells and pumping stations.